Cartagena (a.k.a Cartagena of the Indies to differentiate it from its Spanish homonym) is a city that welcomes travelers like few others in the world. Founded in 1533, Cartagena is located towards the northeast of Colombia and set at the center of the Caribbean shoreline. In the past, Cartagena's location made it into one of the most important ports of the continent and, being home to immeasurable riches and prominent people, the city became a fortress in order to protect what lay within. 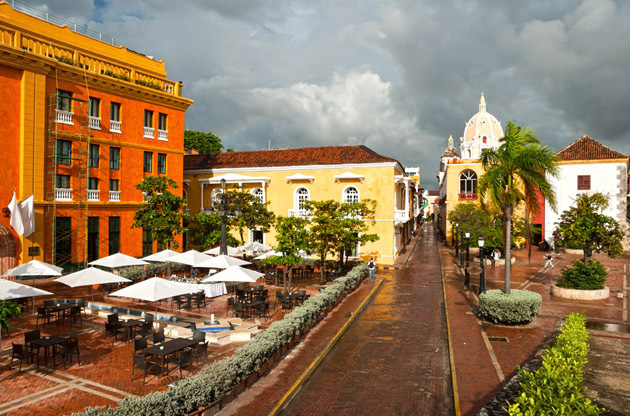 In 1984, the UNESCO declared Cartagena a World Heritage site because although centuries have past, the city still preserves its history with colonial architecture on either side of pebbled streets and buildings that hold whispers of years bygone. This historicity right at the heart of modern life is a prominent feature that adds a certain picturesque look to Cartagena. Cartagena's weather holds a year-round average temperature of 30°C that proves a perfect companion to the refreshing breeze of the Caribbean Sea. Its people are beautiful and friendly. Through the ages, this encounter of different peoples with different cuisines gave birth to an exquisite and exotic gastronomy that uses predominantly seafood, fruits and vegetables in Cartagena. Cartagena plays host to major cultural events every month —Feb./March: The International Film Festival; June/July: The Summer Festival; November: Popular Festivals— and this, alongside its vibrant nightlife, transforms it into a place that will make you think twice before leaving. Your trip to Cartagena will change your notion of beautiful cities and you will consider you top cities list once again. Cartagena waits to be discovered, this time by you, with all the beauty and natural treasures it has. Cartagena lies on the northern coast of Colombia. How to get to Cartagena? Rafael Nuñez International Airport is the airport you will be using and once you arrive, you can choose to hop on one of two types of buses (with or without air conditioning) or get a taxi to go to the city center. Buses have their fare on display and cost a us dollar or so –$1500 or $1900 co pesos, while taxis costs between $5 and $6 us dollars –$9,400 to $10,400 co pesos, the last price is for nighttime and if the air conditioning is in service. An airport-downtown taxi fare should never exceed $12,000 pesos. Once you set your feet on the heart of Cartagena, it is better to keep using them. Move around on foot in order to be able to appreciate fully the historical center. One of the best things of Cartagena is that you can get fresh juice and delicious exotic dishes almost anywhere while on your way to visit the different touristic spots. Take into account that there are TIPs (Touristic Information Points) downtown, where you can get maps and detailed information about Cartagena. San Felipe de Barajas: A military fortress built in 1536 and then expanded in 1667. This striking complex was scenario of multiple raids and battles and it offers a wonderful view of land and sea. Gold Museum: Based on pieces from pre-Columbian cultures, mainly the Zenú, it shows a wide variety of metalwork and pottery, as well as pieces worked out of bones and shells. Inquisition Palace: The building is a perfect example of colonial architecture but the old jails and torture chambers now house the Historical Museum of the city. The Cathedral (Catedral Basílica de Santa Catalina de Alejandría): A beautiful church that took 84 years to build. Its construction began in 1577 and it had to overcome a couple of attacks to the city. Museum of the fortifications: This museum can be found within the Bastion of Santa Catalina and it recounts how the city walls were built, by whom and for which reason. After a day of walking from one spot to the next, and enjoying the different landscapes that offered, there is nothing better than a fine dinner and entertainment. As mentioned above, Cartagena’s cuisine is the result of a multicultural blend of flavors, scents and spices; and so is the case of its colorful nightlife! Here is a quick list of places to eat and party at. Monte Sacro is a Café, Bar, Restaurant that offers a wide variety of dishes. The average price for a meal is $16 us dollars. Nautilus Restaurant, its menu comprises –almost exclusively— seafood along with a wide variety of wines and cocktails. Calle del Arsenal is a street, comprising about 500 meters, full of the best discos to enjoy Latin rhythms. Surrender yourself to the sway of the cha-cha just like the palm trees do! Quiebra Canto is a cultural locale of sorts to be found on Arsenal Street, where you can not only dance but also join music discussions and cultural events from time to time. Chiva Parrandera! There is possibly nothing as Colombian as hoping on a chiva (basically a funny shaped bus); but there is absolutely nothing as fun as spending the night dancing and enjoying some drinks, while being taken around the historical city of Cartagena to enjoy the sights and the illumination. Before bidding good-bye to the beautiful Cartagena, you might want to take a look at some shops and get souvenirs for yourself and your love ones. Within the fortified walls of the historical city center, from the bulwark of Santa Clara to the bulwark of Santa Catalina, you will find what the locals call “bóvedas”; these vaults have been turned into shops, most of them specialized in Colombian handcrafts such as the traditional sombrero vueltiao (turned hat) and purses made out of the same natural fiber. La Popa: a geographical accident 150 meters high, crowned by a church dating back to the beginning of the XVII century that looks out at the city and the coasts. The best way to get there is by a vehicle, the taxi fare is around $3 us dollars –about $5,500 co pesos— but do remember to fix the price before getting on the taxi. Eco-Aquatic Tours: These are tours mainly organized under the patronage of the department of tourism of the city so for up to date information it is best to go by the TIP mentioned above. The Botanic Garden: a place to appreciate the local flora and fauna while enjoying an energizing walk through paradisiac pathways. Cartagena is becoming one of the most important cities in the world's event tourism scene. The number of international congresses, conferences, symposiums, seminars, fairs and tradeshows held in Cartegana has increased significantly in the recent years. The accessibility of the venues and the quality of the hotels in Cartagena, turns the city into a convenient place to host these large scale events. The historical richness and the soul of the city are the other pros for the event attendee as Cartagena offers one of the most interesting and sophisticated travel experience.